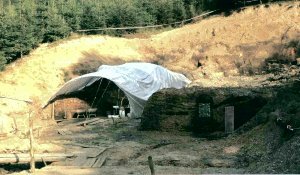 The main research project of the Naturhistorisches Museum Mainz and the Landessammlung für Naturkunde Rheinland-Pfalz are the excavations in the so called "Eckfelder Maar" near Manderscheid/Eifel. They are organized since 1987 by the Landessammlung Rheinland-Pfalz / Naturhistorisches Museum der Stadt Mainz with the help of employees of the museum, volunteers, trainees and workers on job-creating measures from Manderscheid. Scientific research mainly of the flora and certain animal groups are done by the staff of the museum. This significant research project is financed by the Deutsche Forschungsgemeinschaft (DFG) and the Stiftung für Innovation Rheinland-Pfalz and is pushed by a close cooperation with numerous German and foreign scientists and institutions. Nevertheless, the scientific importance is demonstrated by the impressive amount of about more than 100 scientific publications. The isolated occurrence of fossil-bearing sediments near Eckfeld is known since the last century. Its orign was disputed for a long time. The results of geological-geophysical examinations and drillings show that the sediments were deposited in a maar which has a recent diameter of 400 x 500 m. Its initial diameter amounted to roughly 900m. The sediments consist of bitumious laminites (fine-layered "oil-shales") and turbidites (coarser layers), interlocking with marginal volcanic deposits of trachytic composition (pumice). The investigations on the mammals makes it possible to date the fossil-bearing sediments and to refer them to the stage MP13 (upper Middle Eocene, 44-45 Mio. a.). Therefore, Eckfeld is the oldest know maar so far. The amount of the more than 25.000 fossils found so far, reaches from bacteria, mushrooms, algaes, moss, ferns and higher plants (leaves, blossoms, pollen, fruits, seeds) to vertebrates (fish, amphibians, reptiles, birds and mammals). The conservation of the fossils is very good: leaves with cuticula, beetles with structure colours, vertebrates (18 different species of mammals) with soft-tissue, stomach contents and partially hairs. 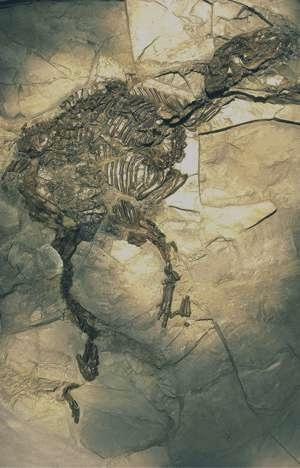 The most outstanding fossils are three skeletons from the "Urpferdchen" (primitive horses), one with a three-dimensionally and undeformed preserved skull, the smallest artiodactyl known so far, two Halbaffen (? ), the oldest honey bee of the world and the oldest evidence for grapes in Rhineland-Palatinate State. Also, Eckfeld is an important locality for fossil plants: blossoms of more than 40 different species of plants are known from more than 600 findings; an insight into the fauna of the Eocene which hasn't been possible so far in such an extent. The maar of Eckfeld and its scientific results makes it possible to get further important knowledge about the geological history of the Eifel (volcanism, geomorphology, palaeoecology), natural deposits and resources (oil source rocks, geochemistry) and world-wide climatic developments (palaeoclimatology, cosmogeology). The entirety of the fossil discoveries and the numerous other information which can be gained in Eckfeld, are an obligation for a continuation and intensification of the excavations and research on the "Eckfelder Maar". Therefore, the museum is dependent on the financial support by the city of Mainz, the community of Manderscheid, sponsors and the state of Rhineland-Palatinate. Meanwhile, the activites of the Landessammlung in Eckfeld are a remarkable factor in the publicity for "soft" tourism in the under-developed area of the western Eifel. A maar museum which was built in 1998 serves for the same purpose and shows the sensational discoveries of the "Eckfelder Maar" to the public.